This cable connects computers to network components in a wired Local Area Network (LAN). Intended for use in the home or office, this cable meets more stringent standards than conventional Category 5 cables and is capable of transmitting data at speeds of up to 1000 Mbps (or to 1 Gigabit per second). 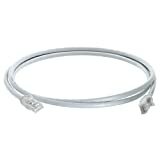 This cable is backed by a Mediabridge Limited 1 Year Warranty. Quality Cat5e Ethernet LAN Cable designed for your important and necessary wired networking applications. 5'e' means 'enhanced', capable of meeting the higher bandwidth requirements of new gigabit LAN devices (1000MB/s). Cat 6 cable is ideal for your voice, data, video and security network installation where extra bandwidth makes the difference. 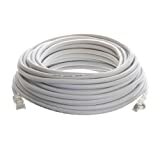 This popular cable meets or exceeds the EIA/TIA 568B performance requirements for Cat 6 cable. Each cable is tested up to 500 MHz and is perfect for use with a 10/100Base-T, 1000Base-T and 10GBase-T high speed Ethernet network installation. That's why each and every cable is backed with the confidence of a lifetime performance guarantee! This network cable tester is a must have for the IT professional. 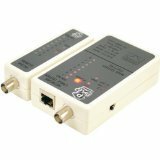 It checks up to four pairs of conductors for continuity and correct polarity for both RJ45 and BNC network cables. Check your system with the PHCT45! 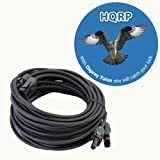 Dimensions: 4.4" X 3.8" x 1"
This HQRP cable specifically designed for connecting photovoltaic system components inside and outside of building and equipment with high mechanical requirements and extreme weather conditions .For permanent installations. Cable made of electron-beam cross-linked insulation and coating; high resistance against heat , cold, oil, abrasion, ozone, UV and weather; with improved reaction in case of fire . low smoke, halogen free , flame free , flame retardant; flexible, easy to strip, very low space requirement, extremely, extremely mechanically robust, very long lifetime. PV1-F 1×4mm2 UV Res DC 1.8KV AC 0.6/1KV. 1 Year warranty! RiteAV – Cat5e Network Ethernet Cable – Blue – 50 ft.